The following is a review of Daily Bible Jigsaw from Planet 316 with the TOS Homeschool Review Crew. We like puzzles. We enjoy putting them together as a family and seeing the completed picture come to life. But puzzles take table space and time, and we often end up losing pieces before completing huge ones with tons of pieces. We memorize Bible verses. 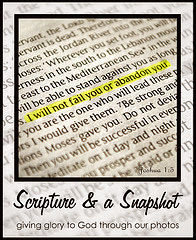 I even share a weekly link pairing verses and pictures. Because of all of those reasons, I was excited to try the new app which pairs puzzles and God's Word. 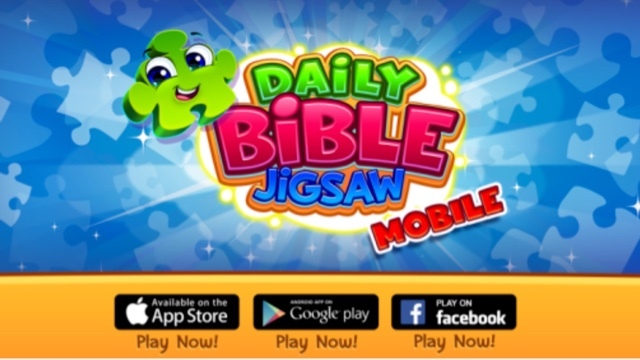 Daily Bible Jigsaw is a timed game accessed online through an app. For this review, after downloading their free app, we received their 500 puzzle coins bundle. 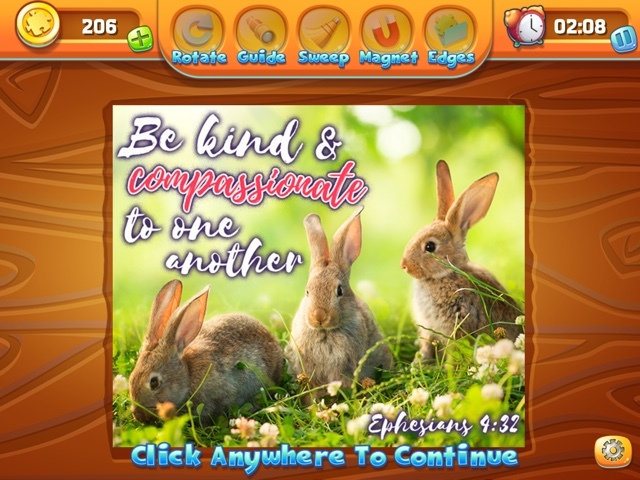 After completely assembling a puzzle with your mouse (or by touching and moving pieces on an iPad or phone) a Bible verse is added to the background. Additional options then pop up allowing you to share the completed puzzle image online. If playing on Facebook, a list of friends also playing shows with the top five rankings based on speed. Because many crew friends who reviewed this are also friends on Facebook, we often showed up in each others' top five list. My score pictured below is typical for me in this game, using the rotate tool. When not using the rotate tool each round takes me about four minutes. At one point this month scores started appearing lower than 30 seconds, and it was determined after questioning those speedy winners that extra tool use can indeed enhance scores. One button (the magnet tool) repeatedly connected two pieces, and you could even complete a whole puzzle quickly just by pushing that button, but the fun challenge factor disappears as well as causing your coin balance to rapidly diminish. 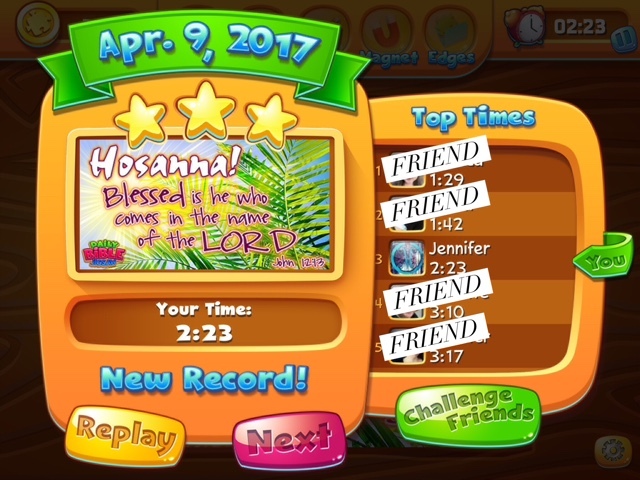 Puzzles can also be repeated, and the highest score is recorded. Other than the timed listing, there is no other interaction with friends within the game. Puzzles during April have often had an Easter theme. I've enjoyed each new puzzle. The time challenge makes me want to complete them faster. The Scripture verses added make it seem like more than a mindless waste of time. I do not pay for online games. As a frugal mom, when so many games are free, it seems wasteful to me to purchase others that are not. If the coin bundle had not been provided, I would not have purchased it and would likely have just stuck with the free puzzles once my 40 coins that came with the game ran out. As it is, I still have plenty of coins to use on that rotate tool that helps me. This puzzle game works on iOS, Google Play, or as a Facebook game. A new free puzzle is available every single day. It is simple to play. The daily puzzle is free, but you can click on helper options for additional coins. I like the rotate option which flips all of the pieces in their proper orientation with one click. If you don't choose that, you can individually rotate each piece as you click on it without "spending" any extra coins. One week during the review, the rotate option was free. I haven't seen any other help options offered as freebies, but there is an additional puzzle set that is always free. The app logo looks just like this picture. The free download includes 40 game coins initially, and you can play the game without using any coins. I used over half of the coins we were given during my review period. You can also find Planet 316 on Facebook or Twitter. This looks fun! I'd like seeing the Scripture every morning to help get my day started. I'm going to download the app and give it a try. Thanks for the heads-up! It is fun! Now I'll be looking for your name as I complete each daily challenge.